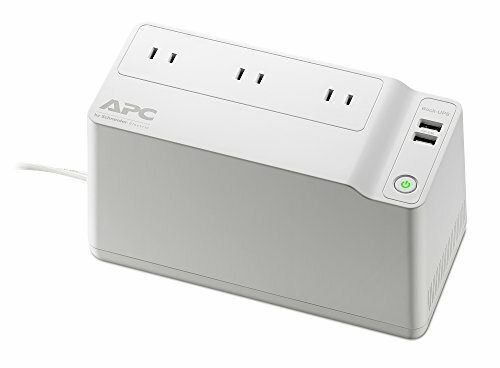 The APC Backups Connect BGE90M system offers guaranteed power protection for networking equipment (router, modem) and other low power devices (smart devices, VoIP or cordless phones, home automation and security systems). When power is disrupted due to storms or outages, the BGE70 keeps you connected to your network for up to 3 hours and charges smart devices. Get weather updates, make phone/video calls, check email, update social media, stream movies, and maintain home automation/security during extended power outages. The Backups Connect BGE90M is an innovative UPS that is designed to power networking equipment for prolonged periods during blackouts. Run a router, modem and another low-power device (power a VoIP or cordless phone, maintain your home security system) for 4.5 hours during a power outage. Additionally, 2 USB charging ports power smartphones and tablets during extended blackouts. Access to the internet is a critical component of our personal and professional lives. Unfortunately, a power outage breaks our line of communication for business operations, news and weather updates, and restricts us from contacting friends and family. At APC by Schneider Electric, we understand the network is critical to your everyday life. Backups Connect will keep your network running, even when the power goes out.